Yeshiva Gedolah of the Five Towns remains committed to its founding principles of keeping a warm and close relationship with every talmid, yungerman, and community member who chooses to use its services. The mesorah of the rebbeim is felt in every act, connection, and relationship with the talmidim and families. Since its inception, the yeshiva has become a sought-after makom Torah for young men returning from learning in Eretz Yisrael. The yeshiva is known for the high-level shiurim given by the prominent rebbeim as well as for its energetic atmosphere and unique hashkafah. The yeshiva continues to accommodate the increasing demand for students, and specifically those who dorm, due to the reputation it has earned locally and across the globe. In addition to having become a prominent makom Torah for its talmidim and kollel yungerleit, YGFT also serves the Five Town community in various ways. The yeshiva maintains the eruv, which involves sending people to check its status and fix it on a weekly basis, irrespective of the weather conditions. The yeshiva provides numerous shiurim to ba’alei batim, ranging in topic and skill level, to accommodate the varied needs of its constituents. Its doors are open to all who wish to learn in its inspiring atmosphere. The yeshiva’s yungerleit are available as chavrusas for interested ba’alei batim. Young boys and girls have a growing number of opportunities to come and share in the growth sought by all those who enter the yeshiva’s doors. At the yeshiva’s 16th annual dinner, the greater community will once again come together to celebrate YGFT’s growing accomplishments and put faces to the names of some of those who have graciously shared in the responsibilities towards facilitating its success. Guests of Honor: Dr. Joshua and Mrs. Shiffy Fox. The strong kesher of Dr. Josh and Shiffy Fox with YGFT began when their son Yitzy joined the yeshiva. The relationship strengthened when their son Bentzy followed a few years later, and eventually it evolved into so much more. Their home is permeated with mesirus nefesh for Torah and dedication to the klal. Dr. Fox is the director of Advanced Dermatology and the Center for Laser and Cosmetic Surgery. He has developed a skin research foundation and his innovative techniques in dermatology have been published widely. Dr. Fox has served on the board of many mosdos, both locally and in Eretz Yisrael. He was president of Congregation Shaaray Tefila in Lawrence and is one of the four founders of Yeshiva Ketana of Long Island. Many do not know that he received semichah from Bais Medrah L’Torah in Chicago prior to becoming a doctor. Despite a busy schedule, Dr. Fox makes time to learn several sedarim throughout the week. Shiffy Fox has served as president of the women’s league of several institutions and chaired events for many Jewish causes. Mrs. Fox maintains a chasan-kallah apartment in the Fox home, allowing young couples to get on their feet in the early stages of marriage. She uses her leadership skills to help manage her husband’s medical practice and supports her husband’s endeavors on behalf of Klal Yisrael. Shiffy, an occupational therapist by profession, currently dedicates her time and energy to raising their beautiful children and grandchildren. The Foxes truly exemplify a couple steeped in chesed and dedicated to a life encapsulated in Torah. They are the proud parents of their four married children, as well as their children who are living at home. Their children are marbitzei Torah in Eretz Yisrael, Dallas, Monsey, and Far Rockaway. Dr. and Mrs. Fox are ardent supporters of the yeshiva and partner with the yeshiva in the chinuch of their children. Yitzy continues to learn in Yeshiva Gedola while studying for semichah and pursuing his CPA. Bentzy learns in yeshiva as well while pursuing a degree in psychology. YGFT is proud to have such exemplary bachurim in the beis midrash. 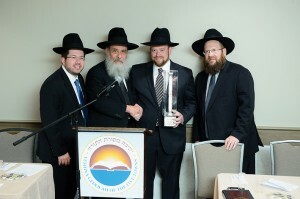 Torah Leadership Award: Zev and Liba Hertz. Zev, who grew up in Miami and later moved to LA, accomplished a tremendous amount in his three-plus years in yeshiva. After coming to the yeshiva from such noteworthy establishments such as Ohr Sameach, Mir, Lakewood, and Ner Yisroel, Zev found a home for himself in the yeshiva. His hasmadah and seriousness were assets for him and the yeshiva during his tenure here. Zev continues to maintain his connection to the yeshiva and its rebbeim but, more importantly, maintains that focus on learning and Yiddishkeit despite his busy work day in the family’s real-estate business. Leba, who grew up in LA but also spent time at Yavne in Cleveland, is a staunch supporter of Zev’s learning. Her selflessness and passion allow the family to raise their children to the highest standards. Leba, when she is not busy raising their family, teaches in Toras Emes, which all of their children attend as well. The two of them are the leaders in their very quiet way in representing Torah and the impact it has in every aspect of their lives. To watch them is to be inspired by them. Harbotzas Torah Award: Rabbi Nessanel and Adina Snow. The Snow family, who settled in Woodmere after their time in the yeshiva’s kollel, is continually offering the yeshiva opportunities to take pride in their accomplishments. Their collective dedication to the yeshiva and the growth of Torah is an inspiration to us all. Nesanel learned in yeshiva and excelled first as a bachur and later as an avreich in the kollel. As a young boy, he grew up in Woodmere, attending Yeshiva of South Shore and Rambam, followed by Ohr Yerushalayim, subsequently entering the Yeshiva Gedolah some 15 years ago. More recently, Nesanel moved on to work in the administration of the Vaad HaKashrus of the Five Towns, continuing his avodas ha’kodesh in a significant way. On top of that, he finds time and energy to run a morning seder in the yeshiva before the early minyan, as well as a night seder program after a long day at work. It’s this type of dedication to learning and teaching Torah that has made him a standout in yeshiva over the years. Adina (nee Feit) Snow grew up in Staten Island. After completing her schooling, she spends her day as a speech therapist in Crown Heights. If that were not enough to keep busy, she cares for their children who attend Siach Yitzchok and Bnos Bais Yaakov, and for their baby at home. Both Nesanel and his wife come from parents and homes that embody ahavas chesed and are machshiv Torah. Please join YGFT at 7 p.m. on Wednesday, February 13 at the White Shul in Far Rockaway to recognize these special families for their tireless service and dedication to the yeshiva, their communities, and Klal Yisrael. For more information, please call 516-295-8900, ext. 4, or visit YGFT.org/dinner.